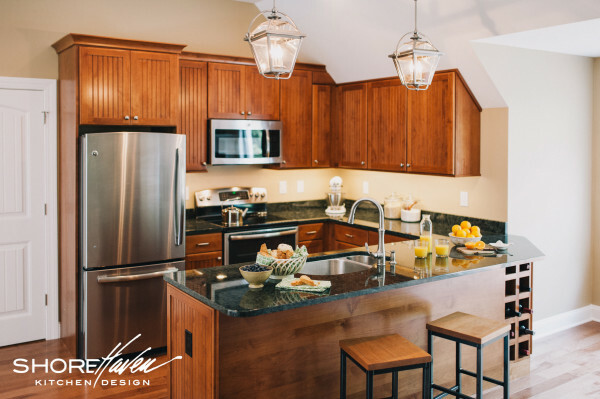 Type “carriage house style” into google, houzz, or pinterest and you’ll be bombarded with everything from architecture and design, to garage doors and home lighting. Originally carriage houses were outbuildings built to house horse carriages. Sometimes the horses lived in the same structure. Sometimes the caretakers for the horses and carriages lived in an apartment on the second floor. Some carriage houses were modest, others elaborate. Today, Saratoga Springs, New York, with all of it’s horse racing history, historic architecture and high-demand real estate, has embraced the carriage house and all of it’s old world charm. This past spring friends of ours built a new home and included a mother-in-law suite above the garage. 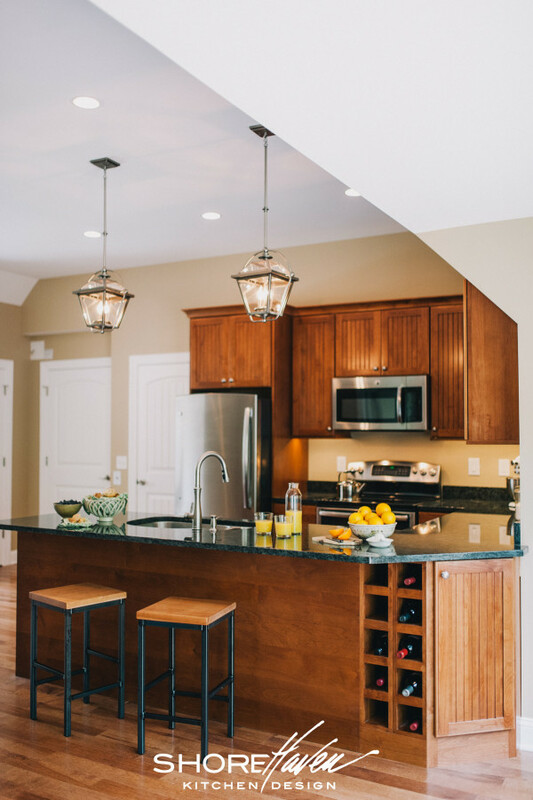 In keeping with the carriage house style of their Saratoga neighbors, we designed the kitchen with beadboard paneled cherry cabinets by Decora, local green granite counters and pewter lantern-style pendants. The angled ceiling, created by a shed gabled roof and window dormers, adds interest and highlights the lantern pendants. Along with the high ceilings, an abundance of natural light makes the apartment feels spacious and airy. And we can’t forget the wall paint color, Sherwin Williams Bittersweet Stem, a nice warm neutral that pulls everything together.